I just found an inspiration today. It’s a do-it-yourself shoe makeover. 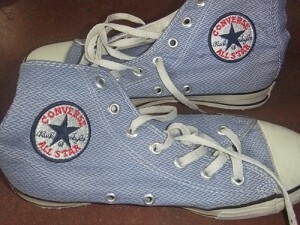 I’m not a craft expert or a DIY guru, but hope to convert my old Chuck Taylor sneaker into something like this. This is a cool idea, right? Thanks, Mom Spark for the DIY inspiration! This entry was posted in Footwear, Shoes and tagged convert chuck taylor sneaker to elastic shoes, DIY shoe makeover on June 19, 2013 by Mommy Yam.